By the time Edgar Winter left his hometown of Beaumont, Texas in the 1960’s, he was already technically proficient in every aspect of music. A child prodigy who achieved international success early on, Edgar has found an audience in every major entertainment medium–music, film and television. A prolific writer, Edgar’s music encompasses many different genres, including rock, jazz, blues, and pop. From his critically acclaimed 1970 debut release, Entrance, he has demonstrated his unique style and ability to cross the genre lines and do the unexpected. His early recording of “Tobacco Road” is a powerful, emotionally devastating masterpiece that propelled him into the national spotlight. Edgar followed Entrance with two hit albums backed by his group White Trash, a group originally comprised of musicians from Texas and Louisiana. White Trash enjoyed huge success, both with the 1971 release of the studio album, Edgar Winter’s White Trash, and with 1972’s follow-up live gold album, Roadwork. In late 1972 Edgar brought together Dan Hartman, Ronnie Montrose and Chuck Ruff to form The Edgar Winter Group, the legendary band that created such hits as the number one Frankenstein and the ever popular Free Ride. Released in 1973, They Only Come Out at Night peaked at the number 3 position on the Billboard Hot 200 and stayed on the charts for an impressive 80 weeks. It was certified gold in April 1973 and double platinum in November 1986. Edgar invented the keyboard body strap early in his career, an innovation that allows him the freedom to move around on stage during his multi-instrument high-energy performances. He was also the first artist to feature a synthesizer as the main instrument in a song. Frankenstein revolutionized rock and roll and opened up a whole new world of possibilities with experimentation and sound. After They Only Come Out At Night, Edgar released Shock Treatment, featuring guitarist Rick Derringer in place of Ronnie Montrose. Later albums included Jasmine Nightdreams, The Edgar Winter Group with Rick Derringer, a live album, Together Live With Johnny Winter, Recycled, a reunion with White Trash, Standing On Rock, Mission Earth, Live In Japan, Not A Kid Anymore, The Real Deal, and Winter Blues. With over 20 albums and numerous collaborative efforts to his credit, Edgar Winter has not been satisfied to ride the wave of popular music stardom. Major national television and radio campaigns have relied on Edgar’s music to advertise their products. Edgar has also made frequent television appearances, both to promote his music, and to give his opinions on everything from Politically Incorrect to a commercial with George Hamilton for Miller Lite beer. He has appeared in the film “Netherworld”, and the TV shows “The Cape”, “Mysterious Ways”, “Dave Letterman”, and “Jimmy Kimmel”. Edgar’s music can be heard in no fewer than fifteen film and television projects, including Netherworld, Air America, My Cousin Vinny, Encino Man, Son In Law, What’s Love Got to do With It, Wayne’s World 2, Starkid, Wag the Dog, Knockabout Guys, Duets, Radio, The Simpsons, Queer as Folk, and Tupac Resurrection. Edgar’s hauntingly beautiful song, Dying to Live, is featured as “Runnin” (Dying To Live) in the film “Tupac Resurrection”, the biography on the life of rapper Tupac Shakur. Produced by Eminem, the song uses the vocal talents of the Notorious B.I.G., Tupac, and Edgar Winter himself. “Runnin” is on numerous Billboard charts. It peaked at number 5 on the Hot R&B/Hip Hop Singles Sales chart, and the soundtrack CD was number 1 for 8 consecutive weeks. Edgar’s CD and DVD, titled, “Live At The Galaxy” was recorded live at the Galaxy Theatre for Classic Pictures in 2003. It features the songs, “Keep Playing That Rock and Roll”, “Turn On Your Love Light”, “Free Ride”, “Texas”, “Show Your Love”, “New Orleans”, “Frankenstein” and “Tobacco Road”. In addition, the DVD includes a 30 Minute Documentary, “Edgar Winter: The Man and His Music”. 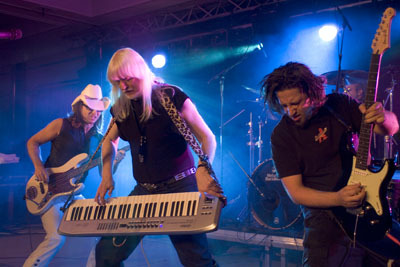 Edgar Winter’s live shows consistently receive rave reviews. His music is always evolving and he is a master at stretching his skill and imagination to produce amazing results. He continues to thrill audiences with his live performances, always remaining on the cutting edge of music and style. Edgar is now at the very top of his game, and his future looks even brighter than his past. envoyez un e-mail à info@spiritof66.com pour recevoir la marche à suivre. Just send an e-mail at info@spiritof66.com and we’ll send you all instructions.